Ever since the company was founded on 16 December 1939, the name Pilatus Aircraft has stood for Swiss quality and innovation. 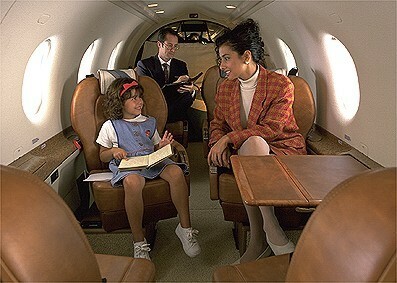 Pilatus has already celebrated many successes in over 65 years of operation. With dedication and ambition it has turned even difficult times into opportunities. The short Pilatus chronicle describes the major milestones in the company’s history. In winter 1941, construction began on a special aircraft, the SB-2. The Pelikan was conceived as a “slow-flying” aircraft. 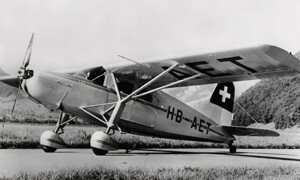 Aircraft with short take-off and landing and steep climbing capabilities were required for use in the narrow Alpine valleys at that time. The maiden flight of the SB-2 Pelikan took place on 30 May 1944. 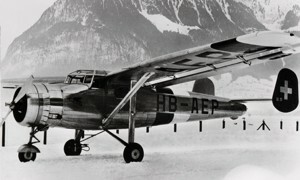 After extensive testing the only aircraft of this type ever produced went to Alpar AG in Berne. The “demise” of the Pelikan occurred on 13 June 1948, during an air display. An unnoticed transverse fracture led to the Pelikan’s nose wheel sheering off, causing the aircraft to flip over. Repair was out of the question. The P-4 was designed as a working aircraft. The aim was to build a robust aircraft with docile flying characteristics at slow speeds, requiring only short take-off and landing runs and little maintenance. The P-4 HB-AET completed its first flight on 22 March 1948. Series production never went ahead due to capacity bottlenecks. On 13 October 1957, the P-4 crashed in the Susten region and was completely written off while on an exercise with the Air Rescue Service. Pilatus Aircraft Thad owned the P-4 until that time. 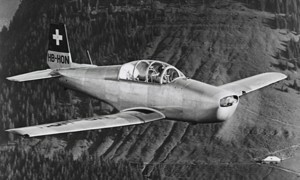 In 1952 Pilatus began to develop a new trainer aircraft in order to keep up with the demands of pilot training. The end result was the P-3. 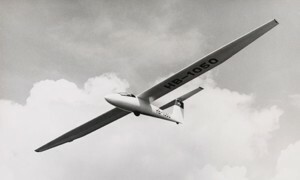 The maiden flight of the 3.01 HB-HON prototype took place on 3 September 1953, piloted by Georg Gisler, the test pilot at that time. The two-seater P-3 school and training aircraft was an all-metal, cantilevered low-wing monoplane. 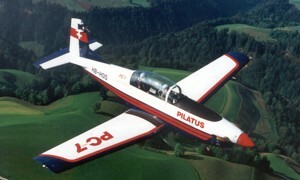 The P-3 was produced in series for the Swiss Air Force and was the first Pilatus aircraft to be exported. The Brazilian navy purchased six aircraft. A total of 84 aircraft were produced and sold. 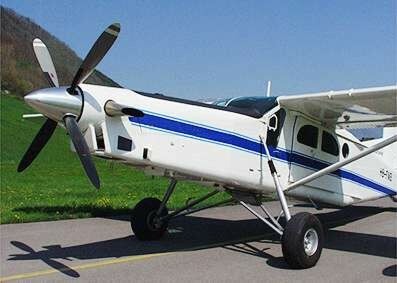 The first B-4/PC-11 made its maiden flight on 5 May 1972. The B-4/PC-11 is a standard class glider and is suitable not just for group operations and competition pilots but also for high altitude flying, flying in clouds and unlimited aerobatics training. Three hundred and twenty two all-metal gliders of this type were delivered worldwide prior to June 1978, when production rights were sold to the Japanese NIPPI company. The PC-7 is a low-wing, all-metal monoplane developed from the P-3. 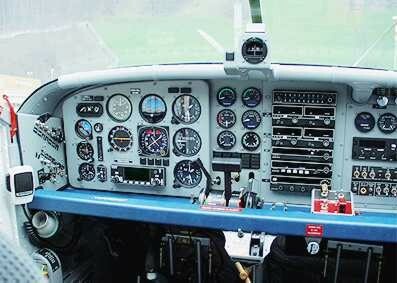 It has a PTA6A-25A engine from Pratt & Whitney and a cruising speed of 375 to 415 km/h. The first machine produced, in series, had its maiden flight on 19 August 1978. The PC-7 is in action all over the world as a jet trainer replacement for both civil and military pilot training and has an excellent reputation among pilots. The PC-7 can also count the Swiss Air Force among its customers, the air force having signed a contract for over 40 PC-7s in 1981, some of which are still in service. A total of approx. 450 aircraft have been sold to 21 countries.